run cmake -G “MSYS Makefiles” . Last edited by LordSupremePerson on Mon Feb 13, 2012 6:54 am, edited 2 times in total. Last edited by LordSupremePerson on Mon Feb 13, 2012 6:50 am, edited 9 times in total. 1. 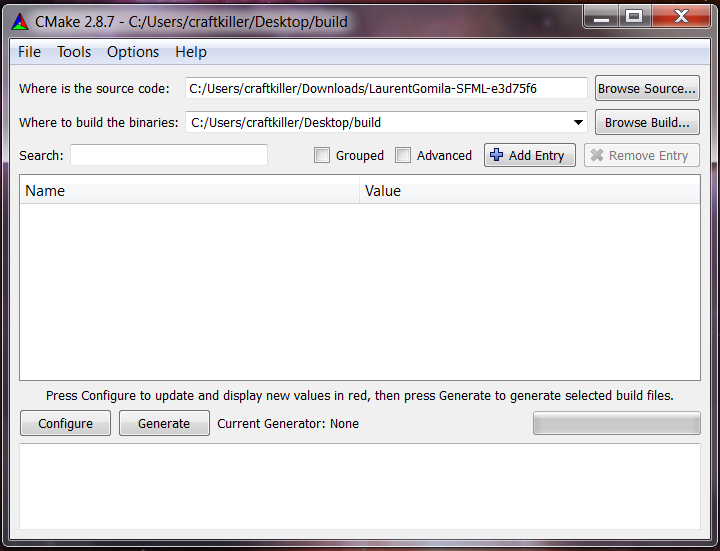 Follow the online tutorial to compile and install SFML 2.0 (http://www.sfml-dev.org/tutorials/2.0/compile-with-cmake.php). 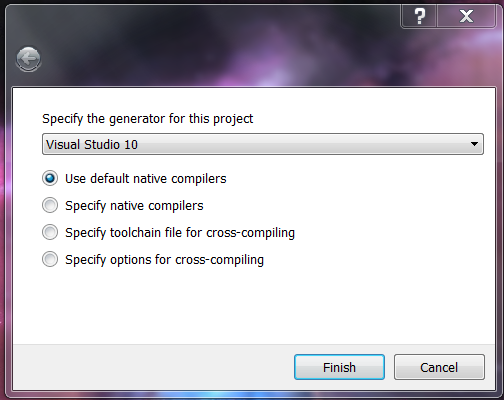 I generated using regular Visual Studio 10, not the 64-bit version. 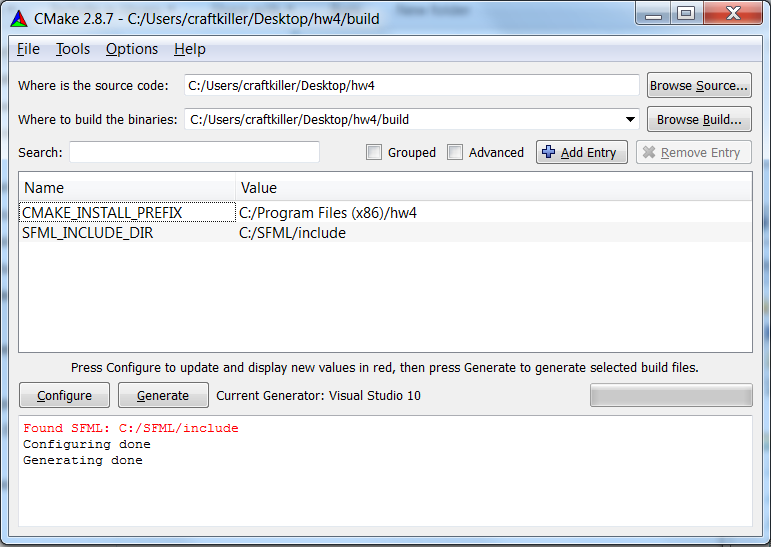 Also, when you build it, build the "BUILD ALL" option, then also build the "INSTALL" option. NOTE - I'm using ... instead of correct path, which will change depending on where you installed everything. A)In Project Properties, under VC++ Directories, add "...\SFML\include" and "...\glew-1.7.0\include" to "Include Directories", include being where your cmake project installed it to. For me, it was under C:\ProgramFiles(x86)\. Similarly, you need to include "...\SFML\lib" under "Library Directories". B)In Project Properties/C/C++/General, under Additional Include Directories, add "...\glew-1.7.0\lib"
C)In Project Properties/C/C++/Preprocessor, add SFML_DYNAMIC to "Preprocessor Definitions"
D)In Project Properties/Linker/General, add "...\glew-1.7.0\lib" to "Additional Library Dependencies"
This is actually more than you need for this particular code, but it covers all of SFML's bases. 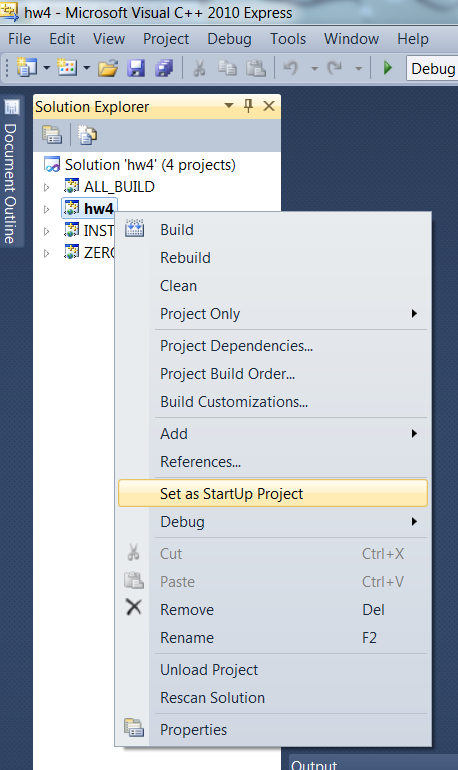 3) Now you're done editing Project Properties. 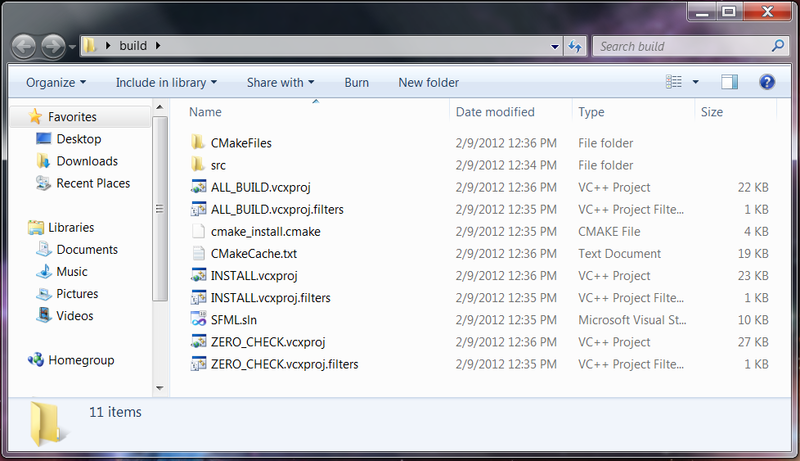 All you have to do now is drop the .dll's that are in that same installed folder to where they should go. You may be able to drop them in System32 (sloppy). I have them in my project folder (also sloppy). Remember, the folder you downloaded and built from is not necessarily the correct one, mine only worked when I linked with the folder that was created when I installed the project. Using Tom's SFML method I was also receiving the Retarded Red Triangles on my W500, I also tried the solution on my desktop with an ATI card with the same result. This seemed odd to me so I started poking around in the code and doing some research. I have narrowed the problem down to the shaders as commenting out the call the CreateShaders() in the Initialize() function causes the four petal flower thing to render properly (albeit without the rainbow effect). I'll continue looking into the issue later today. Found the error and have it "fully" working now (Still throws me a GL_INVALID_VALUE error in the glDeleteShader() calls but it works otherwise). Problem was that the attribute indices weren't properly bound before the call to glLinkProblem so the shaders didn't know where to begin, from what I understand this is a problem on ATI and not Nvidia due to ATI's GLSL usage being much stricter than Nvidia's. Corrected version of Tom's code is attached. Just want to point out that the error in that code is from Dr. Marc's code and not from mine. 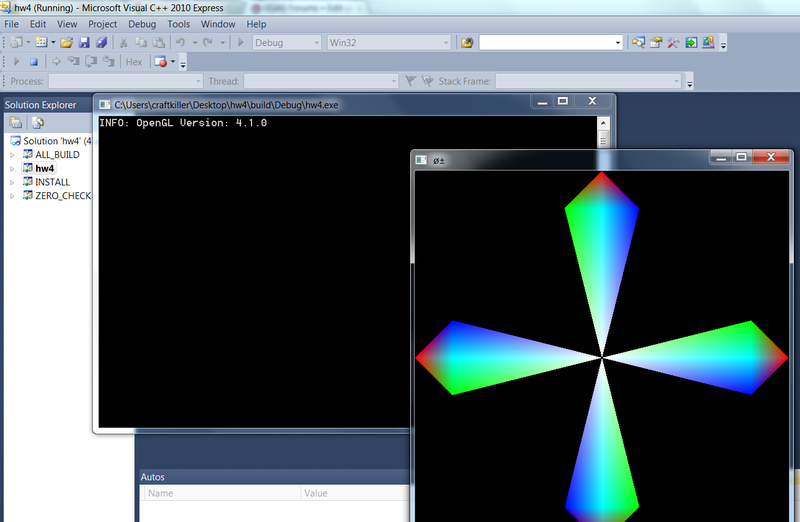 I never touched anything involving the shaders, just converted the GUI calls over to SFML.